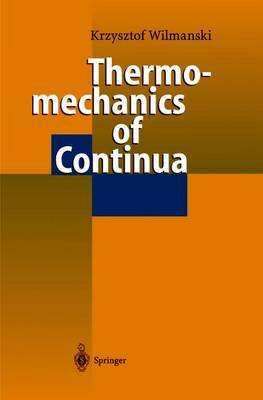 The notion of continuum thermodynamics, adopted in this book, is primarily understood as a strategy for development of continuous models of various physical systems. The examples of such a strategy presented in the book have both the classical character (e. g. thermoelastic materials, viscous fluids, mixtures) and the extended one (ideal gases, Maxwellian fluids, thermoviscoelastic solids etc. ). The latter has been limited intentionally to non-relativistic models; many important relativistic applications of the true extended thermodynamics will not be considered but can be found in the other sources. The notion of extended thermodynamics is also adopted in a less strict sense than suggested by the founders. For instance, in some cases we allow the constitutive dependence not only on the fields themselves but also on some derivatives. In this way, the new thermodynamical models may have some features of the usual nonequilibrium models and some of those of the extended models. This deviation from the strategy of extended thermodynamics is motivated by practical aspects; frequently the technical considerations of extended thermodynamics are so involved that one can no longer see important physical properties of the systems. This book has a different form from that usually found in books on continuum mechanics and continuum thermodynamics. The presentation of the formal structure of continuum thermodynamics is not always as rigorous as a mathematician might anticipate and the choice of physical subjects is too disperse to make a physicist happy.